Mogu is also named boneless painting, in other words, it is a painting without the outline but with forms achieved by washes of ink and color. The name of Mogu was appeared in a book by Guo Ruo Xu in Song Dynasty (960 - 1127). Instead of using the ink lines, Mogu painting uses colors or colored lines and colored gradation to create a painting. Mogu was created by Zhang Zengyao in the Northern and Southern Dynasties (420-589). 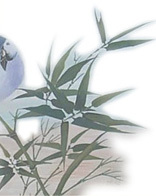 In the Five Dynasties (907-960), Huang Quan significantly developed it to paint trees and flowers. In Tang Dynasty (618 - 917), Yang Sheng mastered and developed it. In Ming Dynasty (1368 to 1644), Xu Wei developed it again and he started applying this technique in landscape. In Qing Dynasty (1644-1911), Yun Shouping (Yun Nantian) made it famous and Ren Bonian, Wu Changshuo developed it forward. Mogu painting has been a small stream in Chinese painting history since it was created, but, there are no many famous Mogu paintings to be passed down. I started to touch Mugo painting after I entered in China Central Academy of Fine Arts. -- Chinese Mogu Painting is a painting that uses the methods of Chinese Xieyi, to meet the result of Chinese Gongbi painting. Therefore, it is between the Chinese Gongbi and Chinese Xieyi. -- "Mogu" in Chinese is means "There Is no Bone". Since ink line is the Bone of Chinese painting, there is no bone, means artists do not paint the Chinese with ink lines, but create a painting with colors or colored line directly. -- Instead of use the Ink Line, Chinese Mogu uses the colors directly. Here are some of my Chinese Mogu paintings that also my assignements in Chinese National Academy of Arts and China Central Academy of Fine Arts and hope you enjoy them and be some help with you to learn Chinese art and culture. This is my 75thChinese Mogu Painting and my 1095th painting since 2003. This is my 74thChinese Mogu Painting and my 1094th painting since 2003.